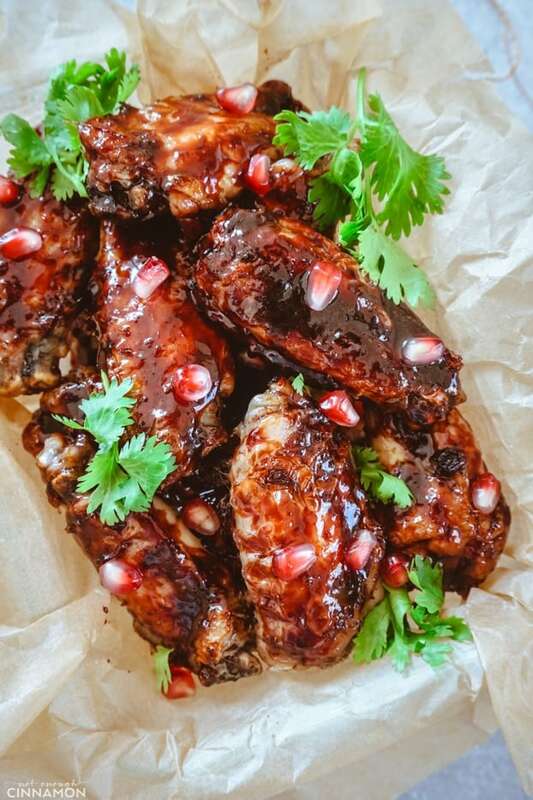 Finger lickin’ good oven baked chicken wings covered in a sticky pomegranate glaze made with four simple ingredients: pomegranate juice, orange juice, garlic and a little bit of vinegar. That’s it. Perfect for parties! Paleo, Whole30 and gluten free. Just a warning before we get started: do have some family members or friends to share these baked chicken wings with because otherwise… you might end up eating the whole batch to yourself (oopsy oops!). They are that good! Let’s see how we make these! Hint: it’s easy! We start with the glaze first. In a medium pot, combine pomegranate juice – 100% pomegranate juice only! – (step 1) and orange juice (step 2). Grate garlic cloves (I used my beloved Microplane for that) and add to the juice mixture. (step 3). Season with salt. 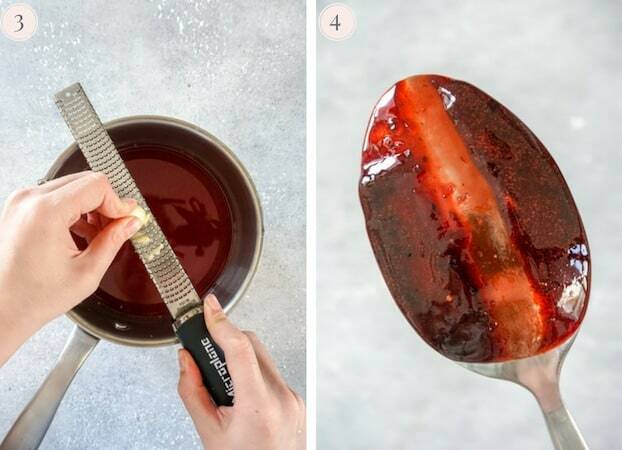 Bring to a gentle boil and cook for 30 to 40 minutes, until it has reduced to about 1/2 cup and it coats the back of the spoon as shown in the picture (step 4). While the glaze is reducing, prepare the chicken. Brush the wings generously with pomegranate glaze and broil for a minute or so to finish cooking (step 6). Top with fresh cilantro leaves and pomegranate arils and…enjoy! The glaze does take a while to reduce, but other than that, it’s a pretty straightforward recipe. What to serve with chicken wings? 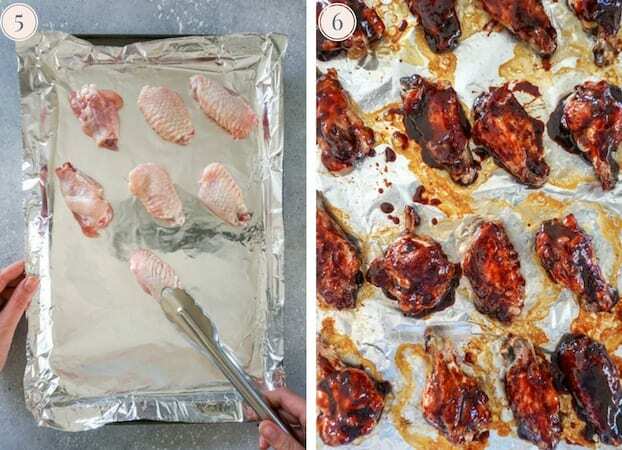 A few cook’s tips to make these baked chicken wings! If possible, try to make these at the last minute. You can prepare the glaze, keep it warm, and bake the chicken separately, and then assemble and broil when you’re ready to serve. The leftovers will still be good, but not as delicious because the glaze won’t be as sticky and a bit runnier. Before baking the chicken, pat dry the skin with paper towel. Humidity is the enemy of crispness! At first, it may seem like the juice with never thicken. But be patient! It will eventually turn into a beautiful, glossy and sticky glaze. Resist the temptation to cook the mixture on very high heat to speed up the process, you might just end up burning the glaze! If you tried these baked chicken wings, don’t forget to rate the recipe below and let me know how it went in the comments – I love hearing from you! You can also follow me on Instagram, Pinterest and Facebook for more deliciousness and behind-the-scenes! 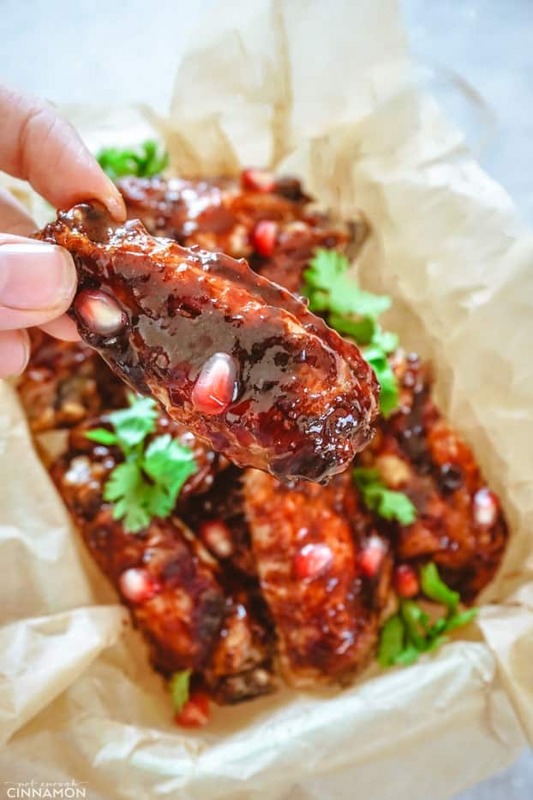 Finger lickin' good chicken wings baked in the oven and covered in a sticky pomegranate glaze made with four simple ingredients: pomegranate juice, orange juice, garlic and a little bit of vinegar. That's it. Perfect for parties! Paleo, Whole30 and gluten free. Start with the glaze first. 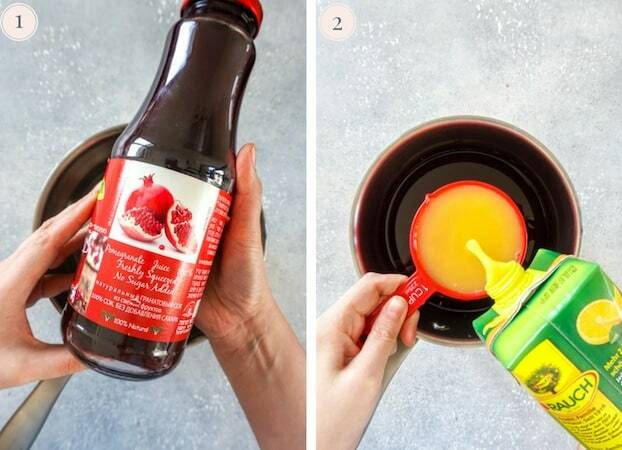 In a saucepan, combine orange juice, pomegranate juice and garlic. Season with salt. Bring to a boil, and cook uncovered with a gentle boil for about 40 minutes (from the moment it starts boiling), until it's reduced to about 1/2 cup, whisking for time to time. Towards the end, pay close attention to the glaze to make sure it doesn't burn (it can happen quickly). Reduce the heat if it's boiling too much. The glaze is ready when it's thick enough to coat the back of a spoon and you can run your finger through it to make a line and it's doesn't fill in (see picture #4 above). It will be a little too thick as it cools down, but perfect when you add in the vinegar. Stir in vinegar and keep on very low heat (just to keep it slightly warm and prevent it from hardening) while you prepare the wings. Preheat oven to 400F/200C and line a baking sheet with aluminum foil. Spray with a little bit of cooking spray. Pat dry the chicken with paper towels to make sure the skin is really dry (for a crispy skin!). Arrange the wings on the baking sheet. Bake between 15 to 30 minutes (depending on the size of the wings and your oven) or until golden cooked through. 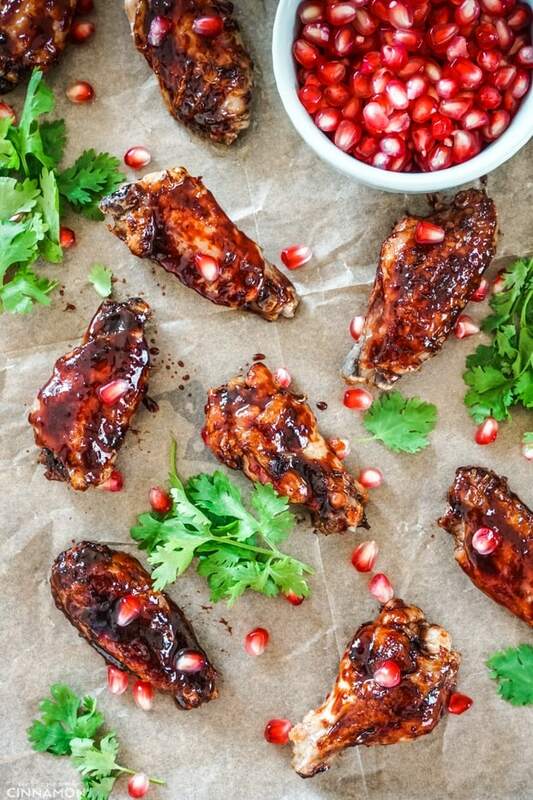 Remove from the oven and brush the wings generously on all sides with pomegranate glaze. Return to the oven and broil on high for about one minute, paying close attention not to burn the wings. Serve hot with cilantro leaves and pomegranate arils. MAKE AHEAD: If possible, try to make these at the last minute. You can prepare the glaze, keep it warm, and bake the chicken separately, and then assemble and broil when you're ready to serve. The leftovers will still be good, but not as delicious because the glaze won't be as sticky and a bit runnier. FREEZING: not recommended because the glaze won't stay thick and sticky. UPDATE NOTE: This post was originally published on September 9, 2013 and republished in October 2018 with an updated recipe, new photos and more tips. 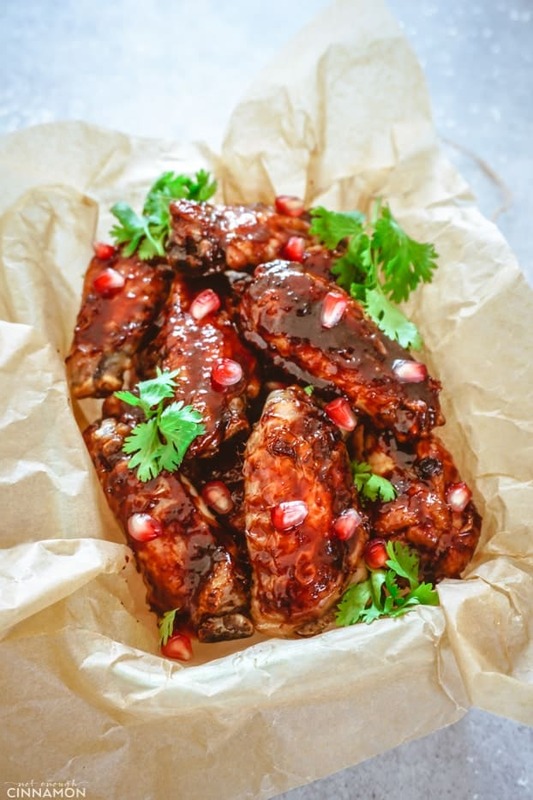 The Pomegranate-Glazed Chicken Wings calls for adding the vinegar to the glaze, but does not have it in the ingredients. Could you please update it? This looks amazing! I would try it with skinless boneless breasts though … I think it would work well. Thanks so much … love your blog! Oops, sorry about that! I updated the recipe. Thanks for letting me know Cathy! I’m sure it would be great with breasts too! But I guess I would just cook them in a skillet (or even slightly undercook them) while the glaze is reducing, transfer them to a baking dish, brush with glaze and broil a minute or two. You just want to make sure the breasts don’t get too dry. I’d be curious to know how it turns out! Waiting to eat while you take pics is such torture! These look absolutely worth it though. YUM! Oh man, these look absolutely amazing. That glaze! My husband has been asking me for months to make chicken wings … I don’t know why but I just haven’t. I really need to go for it! I hardly ever cook chicken wings. Love the look of these though… I am a big fan of pomegranate molasses so I’m sure I’d adore this pomegranate glaze. Thanks Marie! I’m sorry about that Ayla! It can take quite some time before the glaze thickens. How long did you cook it? Tried this today, loved them! The glaze did take a long time to thicken. Oh God, these chicken wings really impress me !!! Love Love Love this recipe! This is absolutely fantastic! So YUMMY! Is good food and this looks like one of the BEST! I love the flavor of pomegranate. So smart of you to combine them with a chicken wing. YUM! When we were in Disney, my son ordered a pomegranate chicken dinner and I was so jealous when it came out. I totally forgot about it until now and can’t wait to try your recipe and finally have a taste myself! This glaze has peaked my interest! Wow, these look so good. If I am going to make these, I am not sharing! LOL! Oh, these look so delicious! I will definitely gonna try this! These look such a great treat. That sauce is so thick!